I wrote Time in the Shadows in order to puzzle out why the counterinsurgency practices of enormously powerful state militaries—the US and Israel at the time I was writing the book—so often invoked law and humanitarianism, rather than naked force. And why so much of their war-fighting pivoted around the mass confinement not only of combatants but civilians. I was also struck by the similarities in the practices of confinement not only between Israel and the US but with historical accounts of colonial confinement effected by Britain and France. For me, what was striking, insidious, devastating, was the less flashy, less visible, practices that were foundational to detention of suspected combatants and incarceration—whether in situ or through resettlement—of troublesome civilians. These practices—law, administration, demographic and anthropological mapping, offshoring—all sounded so dry, so rational, and yet they were grist to the mill of liberal counterinsurgents in so many ways. And the other similarity across a century and several continents seemed to be the repetition ad nauseam of the language of “protection” and of “security” to frame or rename or euphemise atrocities. 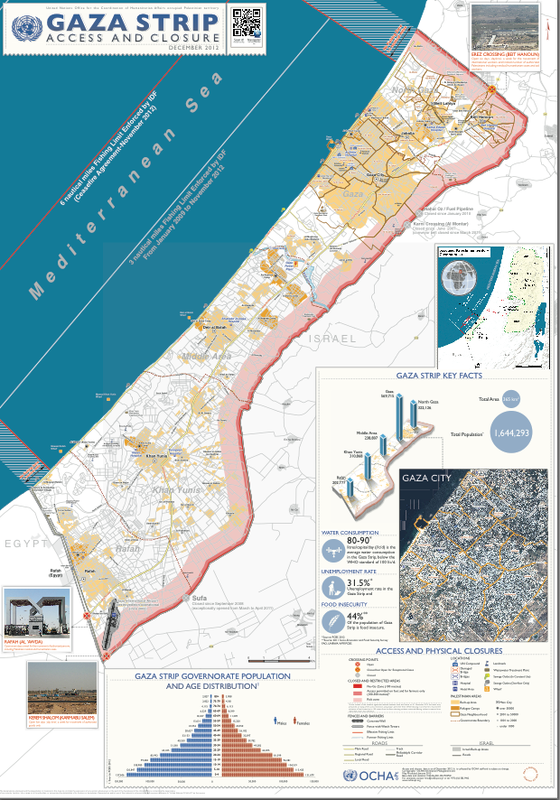 Among the technologies that best embody this language of protection used to violently pacify a population in counterinsurgencies are the separation wall and the various “protective” zones invented by the Israeli military to fragment the Palestinian territories and ensure panopticon-like surveillance and monitoring capability over these fragmented zones. These technologies have specific histories and are mirrored in so many different contexts. The following excerpt is an attempt at situating the wall and the various zones in both a longer historical continuum with colonial practices, while also reflecting on the settler-colonial specificities of their present form. The use of force based on military necessity must be engaged in good faith and consistent with other rules of IHL, in particular the principles of distinction and proportionality and precautions in and during attack. This does not appear to be the case in the “buffer zone” as the violations to IHL are flagrant, frequent and grave. Israel remains the Occupying Power in the Gaza Strip. In this capacity, it must protect the safety and well-being of the Palestinian population and take Palestinian needs into account. In addition, Israel must also protect Israeli civilians and soldiers, but it is not allowed to do so at disproportionate expense to Palestinian civilian lives and property. 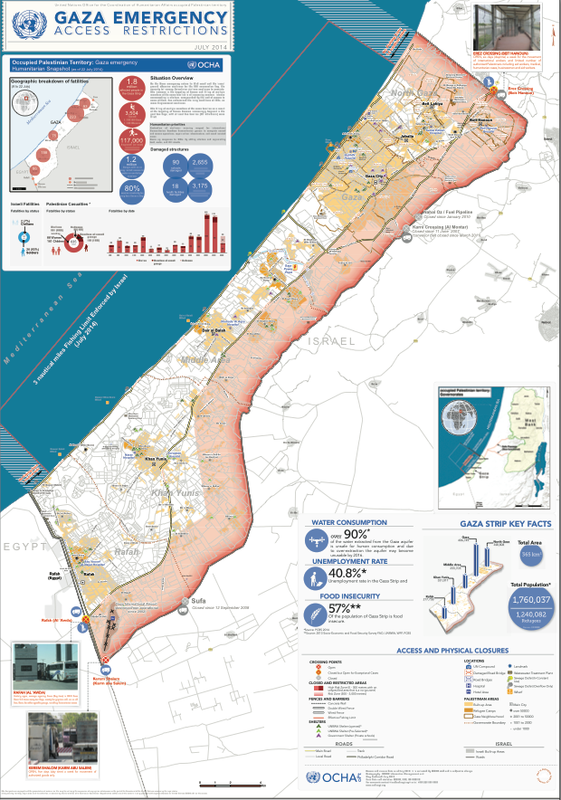 While acknowledging Israel’s security concerns regarding attacks on Israel from the Gaza Strip, the facts and information available show that the unilateral expansion of the “buffer zone” and its enforcement regime result in violations of international humanitarian law and grave infringement of a number of rights of Palestinians. You can download a hi-res version here (see also Léopold Lambert‘s maps and commentary here). 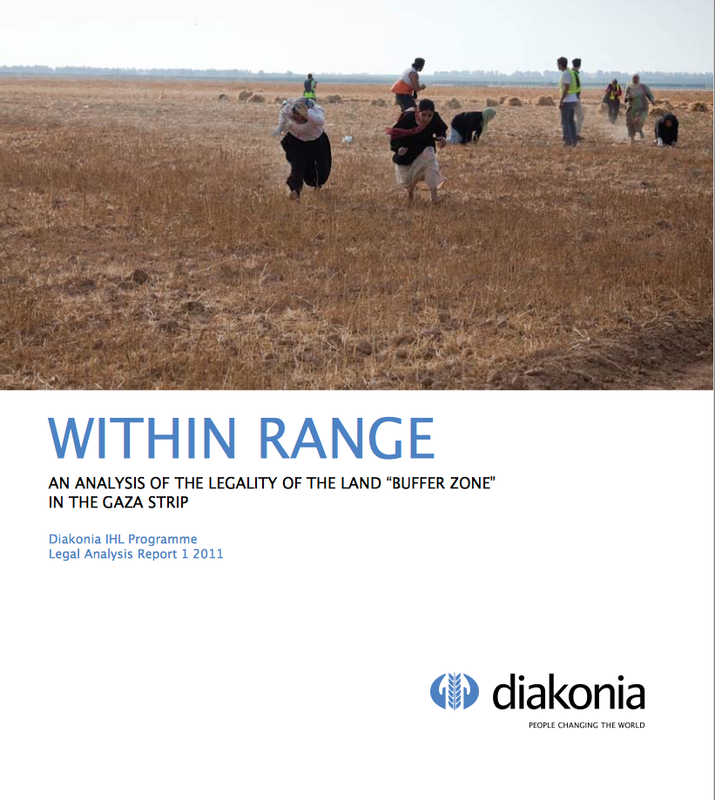 In practice, the UN Office of the Commissioner for Human Rights explained, ‘the “no go zone’’ on land was at times enforced a few hundred metres beyond this, with a “high risk zone” extending sometimes up to 1,500 metres.’ In November 2012 these restrictions were supposed to be eased, as part of the agreement ending the Israeli offensive earlier that month. But as the Commissioner reported, ‘there has been an increased level of uncertainty regarding the access restrictions imposed on land since this date.’ In the spring UN monitoring teams reported that in most cases farmers could not enter lands within 300 metres of the fence and that the Israeli military fired warning shots if they attempted to do so, that in some places the exclusion zone extended beyond 300 metres, and that there was continued concern about the presence of unexploded ordnance in the border areas. 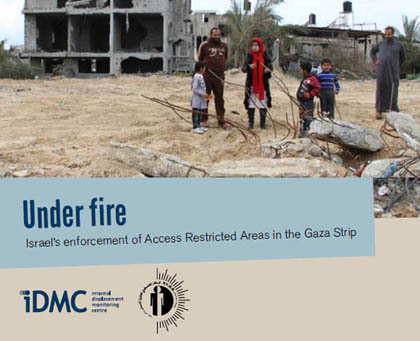 The map produced by Gisha: Legal Center for Freedom and Movement for September 2013, ‘Mapping movement and access‘, reflects these realities, and you can find a detailed report from the Palestinian Center for Human Rights and the IDMC, Under Fire: Israel’s enforcement of access restricted areas in the Gaza Strip (February 2014) here. Unexploded ordnance is a matter of grave concern, but there has also been a history of live-fire incidents (see the graph below). Since December 2013 and before the current Israeli offensive the number of live-fire casualties near the fence was increasing again. In a ten week period between December 2013 and March 2014 B’Tselem field researcher Muhammad Sabah documented 55 civilians injured near the fence: 43 by live fire; 10 by rubber bullets; and two hit by teargas canisters [I can’t link to the report at the moment because the B’Tselem website is under attack and has been taken off the grid; I can now – it’s here]. “I stood in among the ruins watching the kids at work, coming and going with their donkeys and carts. They didn’t seem worried, so I wasn’t worried… I heard the shots, then the screaming, saw the kids running to help their wounded friends. Now I really was outside the comfort zone of fiction. A doctor from Medecins Sans Frontieres told me that the shots were not fired by snipers from the watchtowers on the wall, as I had supposed, but that these scavengers were routinely targeted, electronically from Tel Aviv, which was over 25 kilometres away – ‘Spot and Strike’, the Israelis call it. Today, there is a palpable sense in which the whole of Gaza has become a death zone. 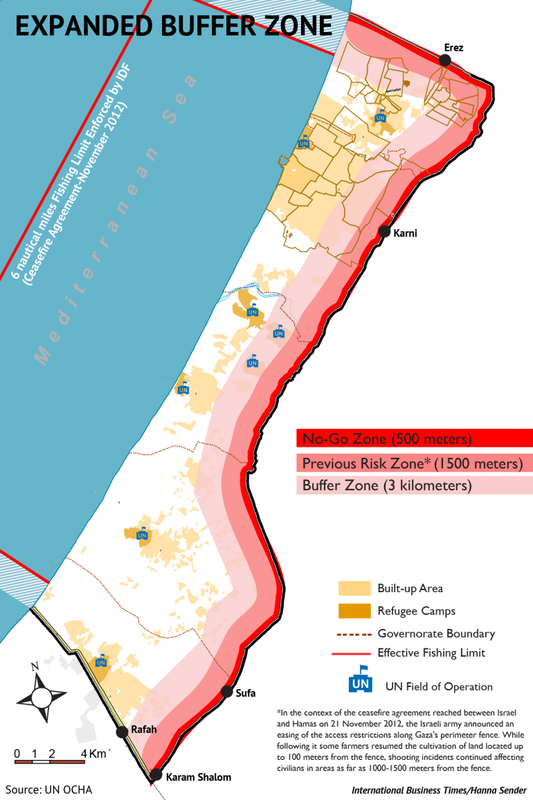 First, Israel has declared a three-kilometre ‘buffer zone’ inside Gaza’s borders which now effectively places 44 per cent of the territory off limits (you can download the OCHA map below here; the second map makes the situation clearer, though it inevitably sacrifices detail). Compare this with the previous map by following the line of the road south-north. Anyone within the zone has been warned by the Israeli military to leave or risk being bombed. 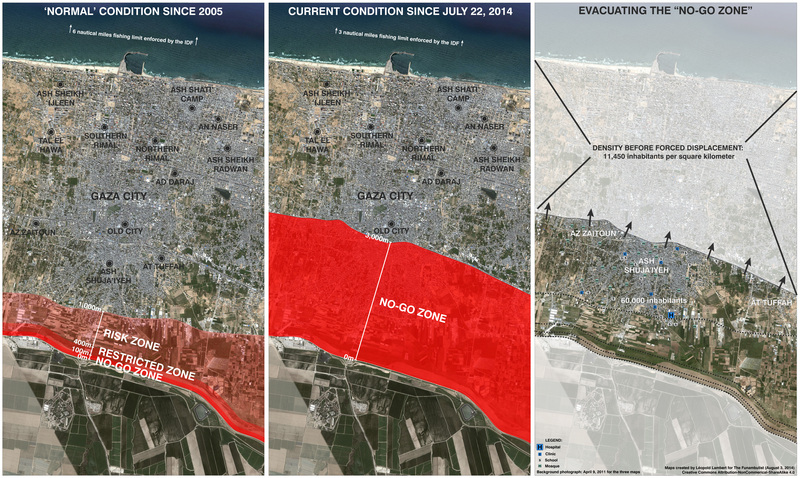 This buffer zone has only exacerbated Gaza’s siege. To the east, Palestinians in Gaza are fenced in by Israeli artillery tanks, mortars, cannon shells and snipers. On Gaza’s western side, Israeli warships form a blockade and allow only a three-mile fishing zone. To the north resides more military checkpoints and soldiers. To the south, the Egyptian military has closed off the Rafah border. 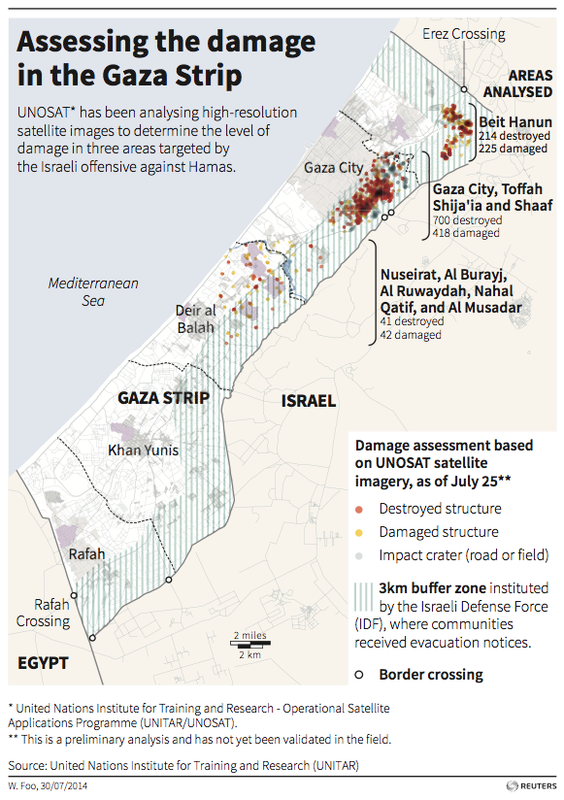 The buffer zone has tightened the Israeli chokehold around Gaza’s small strip of land. Satellite imagery has confirmed the scale of the devastation; the map (right) is based on just three areas within the expanded ‘buffer zone’ and was compiled from imagery taken before the intensification of the onslaught. You can find details of the UNITAR/UNOSAT programme and image files here. If you can bear to get closer, there are photographs taken on the ground here and here. Second, the Israeli military have not confined their operations to the expanded buffer zone, and those who have – somehow – found sanctuary outside its limits (but of necessity still within the closed and shuttered confines of Gaza) have found that they are pursued by aircraft and tanks. 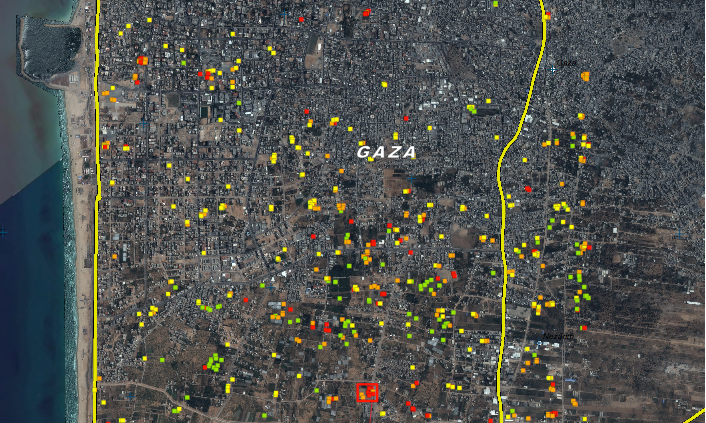 The image below, taken from the same source (and same date) used to compile the map above, shows a wide arc of damage in central Gaza far beyond the ‘zone’ (see also my previous posts here, here and here; you can also find a detailed interactive photo-map of the whole territory from the New York Times here). ‘The problem,’as one young resident explained to Anne Barnard, ‘is that when we are fleeing from the shelling, we still find the shelling around us.’ Stories abound of families seeking refuge only to find death waiting for them. One man told Alexandra Zavis that his brother, four sisters, brother-in-law and five young children escaped from eastern Gaza to what they thought was a safe place in central Gaza City, only to be killed when the top floors of the building collapsed after an Israeli air strike the very next day. Others tell similar stories – one family moving twice before eventually ten of them were killed. And then there are all those who have sought refugee in UNRWA camps, many of them schools, or who have been rushed to hospitals for treatment, only to be bombed and shelled there too. I have put forward the notion of necropolitics and necro-power to account for the various ways in which, in our contemporary world, weapons are deployed in the interest of maximum destruction of persons and the creation of death-worlds, new and unique forms of social existence in which vast populations are subjected to conditions of life conferring upon them the status of living dead. This entry was posted in biopolitics, bombing, Israel/Palestine, law and tagged 'buffer zone', death zone, Gaza, Laleh Khalili, No Man's Land by Derek Gregory. Bookmark the permalink. I think that with your article, it gives a comprehensive vision of the situation. Thank you for such a comprehensive article. I will see if I can add another map to it to show from google earth the amount of dwellings that are now in this buffer zone. I dreamed again that I was in Gaza last night and for some reasons the people I was with were not Palestinians but first nations!